Dark-eyed Junco, Learn All About the Dark-eyed Junco. ■ The Dark-eyed Junco is one of the most common birds in North America and can be found coast to coast and from Alaska to Mexico. A recent estimate set the Junco’s total population at approximately 630 million. 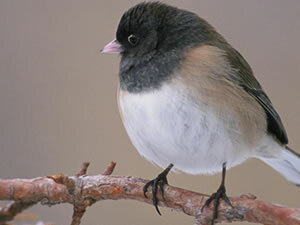 ■ The oldest recorded Dark-eyed Junco was 11 years, 4 months old. ■ Dark-eyed Juncos breed in forests across much of North America and at elevations ranging from sea level to more than 11,000 feet. ■ Dark-eyed Juncos are primarily seed-eaters. At feeders they seem to prefer millet over sunflower seeds. During breeding season, they also eat insects. ■ The Junco clutch size is 3-6 eggs. They have 1-3 broods. Incubation period is 12-13 days. Nesting period is 10-13 days. Egg description is white, gray, pale bluish white, or pale-greenish white speckled with brown, gray and green.